Driver giveaway: Constant current 17mm 1S drivers, current fully adjustable by firmware. This is a delayed giveaway, I didn’t get these done in time for 2000 posts. Now they are almost ready so the actual giveaway thread can start. I’m giving away a few of my latest drivers. Who gets one is based on firmware suggestions and/or what ever reason I feel like. I’ll probably use a random generator for one or two. If you have been around and active for a while (not just entering GAWs) you can enter, but a simple “I’m in” won’t quite do it this time. I’d rather not build, flash, calibrate, test and post them to off someone who’ll just have them laying around in a drawer. Give away rules lower down in this post. If there is any interest in the workings behind these drivers I can start a separate thread but I don’t think it will be needed, these drivers are incompatible with any other BLF driver/firmware that I know of, I think BLF driver/firmware development is going in a different direction than mine. Also, I haven’t used these drivers extensively yet, they are pretty new. I don’t really know how they will hold up in the long run. I guess you could see this giveaway as more of a prototype/product test… ?? They have firmware controlled constant current output (no PWM) from 0.15A to 3A (Fat-3) or 4.5A (Slim-4). 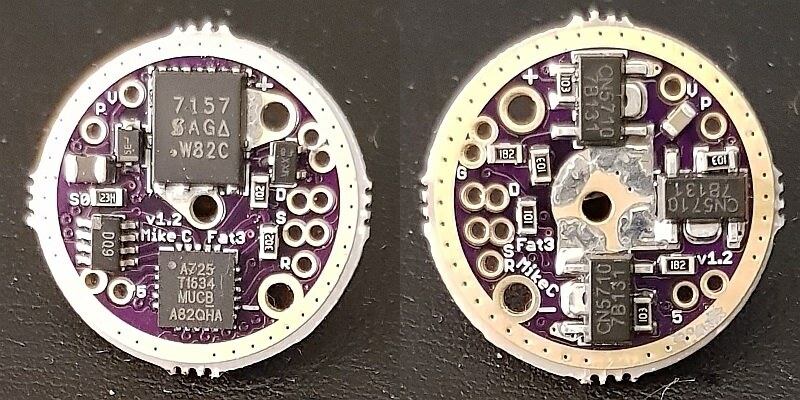 The difference is Fat-3 has a FET for full blast boost, the Slim-4 has a 1.5A current regulator instead. Both have 3 × 1A current regulators on the spring side. I use 10 bit PWM on 0.15A for really low and moonlight modes. These are v1.2, v2 is on the way where I’m aiming to get constant current range down to 0.06 amps before needing PWM. I don’t know how well those will work until I get them, if this giveaway goes on for long enough they might have arrived in time for testing. The battery plus is connected to directly to LED+. The LED- is connected to the 7135 regulators (and/or FET), which then regulates current to GND. In short, the battery feeds + directly to the LED, regulation is done on the low side of the LED. This is what most BLF drivers do, it’s how 7135s operate. The regulators Ive used for my drivers work differently. Battery plus is connected to the regulator which then regulates current to LED+. The LED- is then connected directly to GND. In short, the regulator feeds + to the LED, regulation is done on the high side of the LED. Do not wire spring bypass directly to LED+! Also, the “standard” N-channel FET used on most BLF drivers won’t work on high side so for the Fat-3 I’ve used a P-channel FET with a small gate mosfet. So why these regulators then? Many adjustable current regulators use current sense resistors with really low values than can’t easily by changed. The regulators I’ve used require resistors from 1K and up. This enables me to use a 256 step digi-pot instead of a fixed resistor, giving me 256 possible current outputs from a single regulator. When it reaches max I turn on another regulator with fixed resistor and reset the digi-pot back to lowest output (max resistance). This means each additional regulator gives me another 256 possible current outputs. In order to simplify mode value entries in the firmware I’ve used the formula so each mode is entered as amps by 1000. For example, 1.8A would be entered as 1800. Because of tolerances in the digi-pots, resistors and regulators it won’t be 100% accurate. I could calibrate each driver but I really couldn’t be bothered, it’s accurate enough for me. These drivers support E-switch, clicky (off-switch) and dual switch (E-switch and off-switch) configurations by default, no changes in hardware or firmware. Note that E-switches are connected to VIA holes on the driver, there is no E-switch mounted directly on the driver. These drivers have additional VIAs for flashing firmware, and also two additional inputs/outputs that can be used for another E-switch or controlling lighted switches or slave boards. I haven’t developed any features in firmware to use these things yet but hardware supports them. One of the VIAs is a PWM output. It has however been removed on coming v2 versions because I ran out of space (could be good to know if you plan on using it). If you are interested in trying out one of these drivers, enter this giveaway! I’m looking for inspiration for firmware functionality and features. I want to know what UIs, functions, features you like from your favorite firmware. What makes them your favorite firmware? Don’t just write “like Narsil” or similar, because I have now idea how Narsil or any other firmware work! (I haven’t used other firmware since Star 1.1 for ATtiny13A). I just want to know what specifically you like about them, or what your optimal UI would be like for any dedicated switch type. Do you like normal mode firmware? How many modes? How do you like selecting modes? Or do you prefer ramping? Perhaps you like to able to switch between both? What options you like and how you select them? Stuff like that, and for any switch configuration. Three people are already receiving one of these drivers for various reasons: DavidEF, Schoki and ifratos. You don’t enter, you are receiving one of these of your choice in any case. However, your input on firmware is more than welcome! So, post firmware preferences and/or desires to enter. Give away ends when I’ve built enough of them to start giving them away. Don’t forget to tell me which one of these two drivers you would like, Fat-3 or Slim-4? I’m in but I can’t give any advice due to my lack of knowledge. I’m lucky I can solder them in place. Edit- I will pull myself from the drawing. Other than being able to install it, I will not be of much service toward the build. Awesome GAW, especially to those with the technical know how. MikeC, first of all, thanks for the GAW! I am not able to say something about the driver functioning itself as I know nothing about it’s architecture and all the stuff used to make it…work! If I can give a contribute, I’ll let you know what is my favourite firmware and UI for reverse/forward clicky switches, at the moment! It is the guppy3drv FW (by Dr Jones) and I am using a 17mm driver (from MTN) on a Convoy S2+! I am using it with forward clicky switch for momentary ON and because with a FC switch I can “double click” and access to Turbo or Strobe (depending on the chosen configuration). That driver has a nice true Moonlinght (much lower than an Olight S1R) that is quite practical and usable. It also has well spaced modes and Turbo with double click. Memory is configurable, and so is thermal calibration. I normally use it with no memory to always start on Low mode. The only thing it doesn’t have (not to be used with FC switches, of course) is a reverse mode operation as the Bistro UI. And a quicker way to check battery (a different set of modes needs to be chosen to have the “full” pack ). Still, that is my favourite FW/driver at the time. What I would do with a driver like this (yours)? I’d probably use it in a 14500 light or a Convoy S2+ light, with single or triple emitter configuration! Wish you good work on this!! First a question, is the 10k resistor stacked on the regulators legs by design or was it an afterthought to solve some issue? Just curious as it’s very elegantly done. Is it a pull up / down? OK so since you mention dual switch lights I think that’s one thing we’re really lacking in BLF drivers / FW right now but more and more manufacturers are [finally] getting right. Make the tail clicky a simple on/off in whatever mode you were last in (please include the ability to memorize turbo or strobe) so that the light can be used for true momentary / signaling without putting it in some special mode that only works on one level and has to power cycle to exit. For a dual switch light I would prefer the modes (which are completely controlled by the side button) to be steps, not a ramp. Single click to advance, hold to step back. Maybe press press hold or just fast double click to a hidden strobe mode. My preferred UI for a e-switch is a fast ramp with shortcuts to max and min and memory. For clicky it’s 3-5 modes (user selectable) with a moonlight option. These days I feel all lights should include some sort of battery function, the hobbiest in me would prefer full voltage readout (flashing ones and tenths) but a set number of flashes pertaining to remaining % is OK too or an AUX LED indicator would be more than sufficient if you had the spare IOs for it. It’s a user defined preset level, basically you ramp to a brightness of your choice and do some button presses (maybe a quad click, I forget the exact action) and the light memories this level and you can change it to any other level by repeating the action at any time. Now you have a shortcut to this level with a double click at any time, come to think of it his shortcuts on thay UI are all really good. From on a double click takes you to your preset level, a hold takes you to turbo and a press hold takes you to moon. Hope some of my ramblings qualify me! I’m in for either but the FAT-3 certinally sounds more interesting. Caving, Climbing, Mountaineering, Kayaking, Diving etc any time anywhere!!! If you in the UK let me know and lets Play! Thanks Mike! It would be lovely to have these widely available. I wonder if thd trick of moving mosfet to mcpcb would work with them? I like UIs that have no memory. This way when I start a light I always know what will be the first mode. Typically I want it to be low and that’s what most memoryless drivers provide. I’ve been thinking a bit how to combine the predictability of no memory with the utility of being able to remember the last mode. I came up with several answers. None is universal really…. make memory configurable like LD-x. I’m a terrible reader so may have missed something. Are these 17mm in diameter? I’m agreeing with most of what Ck has said but on modes a maximum of 4 not 5 would be my preference and the ability to turn memory on or off. If memory is off the choice to have the torch turn on in your chosen one of the four modes. Nice work by the way Mike C. I believe I have mentioned before that the work your doing is real black magic. Used in an dual switch light the e-switch sets modes and the (forward) clicky just turns on the light. Easy to use, predictable and somewhat “tactical”. As far as FW goes – the ability to switch between programmable dedicated modes & a ramp, with options for memory or high/low start. My favorite firmware of the moment is on the Dr Jones H17F where you can choose the number of modes (though limited) but enough, the value of each mode configurable with a programmable hidden mode and also secondary group. The only improvements on this to me would be faster acting thermal regulation, voltage readout in actual voltage and some more configuration steps. much time/ light I should get out of a given cell at a chosen mode. Nice work Mike C and thanks for the chance at checking one out. I’m in. Something simple to this would be awesome. I’m in. I maybe put one in an L2 with an Osram white flat. Good to adjust current! My needs from a firmware that ramping smooth. Short click on/off. Be able to reach moon, last used mode and turbo from off with short cut. battery level blinking out. Some good suggestions in here, thanks. I can do a lot of it already, but there are some neat suggestions in here I might be able to implement. Keep ‘em coming! For E-switch and dual switch lights I have the ability to enter config menu to change UI and other settings. From off I turn the light on and keep E-switch pressed and it will start blinking. Each blink is a step in the config menu. For example, release on first blink and you are in the “select UI” menu, release on second and you’re in “mode memory options” etc etc. I haven’t really come up with a satisfying way to do this with clicky switch though. I want it to be easy, but not so easy it will interfere with regular mode selection. I’m now thinking three clicks directly from cold start. If light is on longer than a second or so, window to enter setup is gone. Any other suggestions on this? First a question, is the 10k resistor stacked on the regulators legs by design or was it an afterthought to solve some issue? By design. I found that these regulators need a pull down resistor or they tend to flash on start-up before the enable pin is properly pulled down by MCU. First I was using 0402 resistors, but man do I hate those tiny little things so I decided to save board space and do it this way with 0603 instead. I did try putting the current set resistor this way too, the opposing pin to middle GND pin, but fitting both resistor ends on the middle GND pin proved to be too much of a hassle to assemble. One works nicely though, I put ‘em on during initial assembly for reflow, no need to add after. I wonder if thd trick of moving mosfet to mcpcb would work with them? I have no idea how to make MCPCBs and the only one I know that does this is Led4Power. I could never make MCPCBs at that quality or price so they are only option I know of. I don’t know enough about his designs though. If they are high side mosfets on his MCPCBs I could probably use them with my current Slim-4 design. Maybe I should look into it, having the Slim-4 with an external mosfet for boost/full blast would be pretty neat! Yes (it’s in the thread title ) I remember your black magic comment, and my reply still stands, the stuff you do is magic to me! Your latest competition entry for example… Jaw dropping! This is a very interesting driver concept! Would you mind to share the digi-pot type you selected? No problemo! I use the AD5160. I’ve found the 10K version provides best combo of resolution over range and lowest output for these particular regulators. I power them directly from an IO for lowest parasitic drain on E-switch lights. Whilst I like ramping, I still prefer fixed modes because I can estimate run-time, and select a suitable brightness level, e.g. if I know it is going to have to last so many hours. So make the ramp halt at fixed intervals, corresponding to modes. e.g. press and hold, torch ramps up to next level, then stops. Press and hold again, ramp up to next level. Brief press, then release and hold again, ramping reverses, this time stopping at each lower mode. This is the Narsil, Anduril etc. ramping behaviour, except that they don’t halt at fixed intervals. Narsil does give a brief flicker as the threshold from 7135 only, to FET PWM s transitioned, but that’s not very helpful if you want a bit more power, but still to have confidence in your run time. I’d like to see a quick and easy way to access batt-check. It’s a feature I use a lot, every time I pick up a torch that has it. It would be nice if the torch flickered a warning each time the voltage dropped to another level, corresponding to say 3/4, 1/2, 1/4 remaining (3 blinks, 2 blinks, 1 blink), then a continuous brief blink say once/minute below 1/8. I’d like a “flashy” mode that turns the e-switch (or a forward clicky) into a momentary switch enabling me to e.g. signal morse, or an alpine distress signal, or just flash it around briefly and silently. Output level in this mode to be as memorised in normal operation. Not sure how to get back out of this mode though. Perhaps only suitable for e-switch, where a battery disconnect could revert to normal operation. And an energy efficient alpine distress mode that could last all night. 3 or 6 blinks, repeated every minute. I like what you’ve done with the hardware. Fresh thinking. Do you have a feel for what the thermal limitations will be, worst case, i.e. high cell voltage, low LED Vf, intermediate current setting ? Perhaps FAT-3 with direct drive FET will be more practical than SLIM-4. providing you have found a Pfet with a sufficiently good Rds-on. I see the Consonance regulators automatically limit their junction temperature to a safe level by throttling back. Neat. Maybe good enough for overall thermal management of the torch if in close thermal contact with the shelf (e.g. silicone thermal rubber packing). Do they PWM nicely for the lowest levels ? I’m guessing that you intend a spring bypass lead through the hole in the centre of the spring pad, then linked to the big + via on the other side. Very interested to see how this develops. He explained, with pictures, how it switches the high side. Batt+ spring bypass goes to FET source, LED+ is fet drain. If you do the spring bypass to the led+ pad it will be true direct drive [only]. Do you have a feel for what the thermal limitations will be, worst case, i.e. high cell voltage, low LED Vf, intermediate current setting ? I have not done enough testing on this. The 1.5A CN5711 on the Slim-4 is a lot bigger than the 1A CN5710 regulators, but I have not really tested how the thermal throttling actually works on either of them. I intend on hooking one up without PCB just to test. I built a light with the Slim-4 and took it with me on my three month vacation. I didn’t notice any throttling if it did throttle, but will admit I didn’t have it on intermediate mode for a longer period though, max was maybe five minutes or so. The light is with Convoy M1 host and SST-40 LED. Perhaps FAT-3 with direct drive FET will be more practical than SLIM-4. providing you have found a Pfet with a sufficiently good Rds-on. To be honest, I don’t know all the characteristics to look for with FET choice but I think I picked one with a low enough Rds-on (Vishay Si7157DP). Do they PWM nicely for the lowest levels ? I should hook it up and test that, but haven’t. Looks OK to the eye, but I might be too slow to pickup visible flickering. The spring via is so the battery + wire can have direct contact with the + feed of the FET (Fat-3) or 1.5A regulator (Slim-4) on the other side. As Cereal_killer writes, these are high side regulators and spring bypass to LED+ will result on true direct drive. 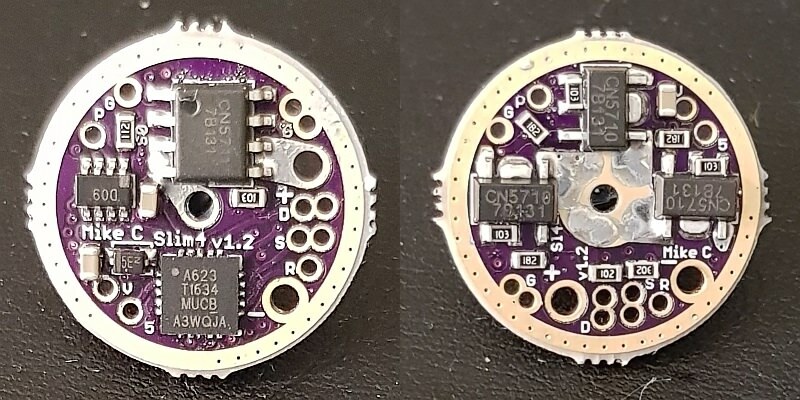 Clearly the + and – vias are for the LED connection only. That hole in the spring pad does still look useful for doing a spring bypass, if the other end of the wire is connected correctly. Or a stud is used, instead of a spring. Those CN5710 regulators do look interesting. A refreshing change from so many basic 7135 designs. Mike, I’m curious: what’s the reason for the numerous large plated through holes? Are those test points? I see what appear to be labels, but they look huge for test points. Also, I don’t see an ICSP land pattern; what’re you using to program these? Cool CN5710-based design! As Tom Tom said, it’s neat to see designs departing from the 7135. I believe that’s the intended design (atleast that’s what the design says to me), as is usual in linear drivers the lower the total resistance the better… Bypassing the batt+ spring to the FET’s source will mean the only real source of resistance in the current path would be that of the FET itself. I took a quick look at https://www.vishay.com/docs/62860/si7157dp.pdf and seems like a sensible choice, for a Pfet. Good Rds(on) when the gate is driven sufficiently. See page 4 of the .pdf, graph “On-Resistance vs. Gate-to-Source Voltage”. If you are using a Schottky for reverse polarity protection, and knowing that the MCU may not drive fully to the rails, with cell voltage below maybe three and a bit volts you might not be driving it hard into saturation. This is the difficulty with Pfets, they rely on holes for conduction rather than electrons, and the physics is rather different. Much easier to make a logic-level Nfet than a Pfet. Also Pfets tend to have higher gate capacitance, making PWMing them at high frequencies a bit trickier. If the gate drive isn’t strong enough (e.g. just an MCU pin) they can spend a lot of time in linear mode during the transitions (i.e. getting hot). Just something to look out for when evaluating. I think it should work well in this application. He’s switching the pfet with an nfet so the gate signal (to the P-FET) will always be full battery voltage,not at the mercy of what the attiny can output and no vdrop from the polarity diode. I read the data sheet again. Page 6. Maximum recommended PWM is 2 kHz. Which is fine by me, for low levels where my eyes don’t respond fast. I only really notice slow PWM when it is raining, or looking at waterfalls, or waving the torch around madly, light-painting etc. and becomes almost psychedelic. However my dog does see it, and averts his gaze on night-time walks, if I bring the wrong torch. Otherwise just a resistor from an output pin (do you have any left ?) could do the job, DC or fast PWM, if you have enough timer-counters left. Page 7 also worth a read. Sounds good. Up to the point that the cell voltage dips (under load) into the region where full gate drive is questionable. But why does anyone still use a Schottky to protect the MCU from reverse polarity ? You can do the same thing with just one tiny cheap Pfet, no other components, and have essentially zero voltage drop to the MCU. And perfect calibration of e.g. V-bat readout by the MCU without dodgy variable components at the buyer’s whim, their temperature sensitivity etc. getting in the way. This also indirectly knocks on to temperature readings as well. My only caveat is that, whilst the Pfet is conducting, it conducts in both directions. Yes they do. Not generally taught. So any decoupling on the MCU side is actually still directly connected to e.g. the LED +V rail, with all the glitchiness and spikes that might entail. A slightly more sophisticated filtering network than a 4R7 resistor and a cap. might be needed. Or not. Good to have some new designs. Im not that familiar with all the firmware’s out there and Im not that picky on a firmware. 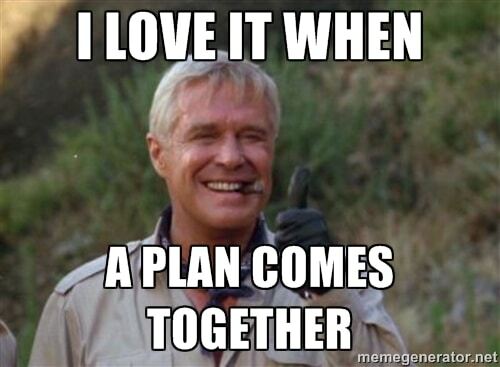 But what I would like to see is both ramping and set modes available. From on double click to go down. From off click and hold to go to max or a custom set level. This is just something I just though about. Yes Im in, would like to use the slim-4 with a white flat for a nice throwy light. Are these 17mm in diameter? Yes, it’s in the thread title. Things really do get worse with age.